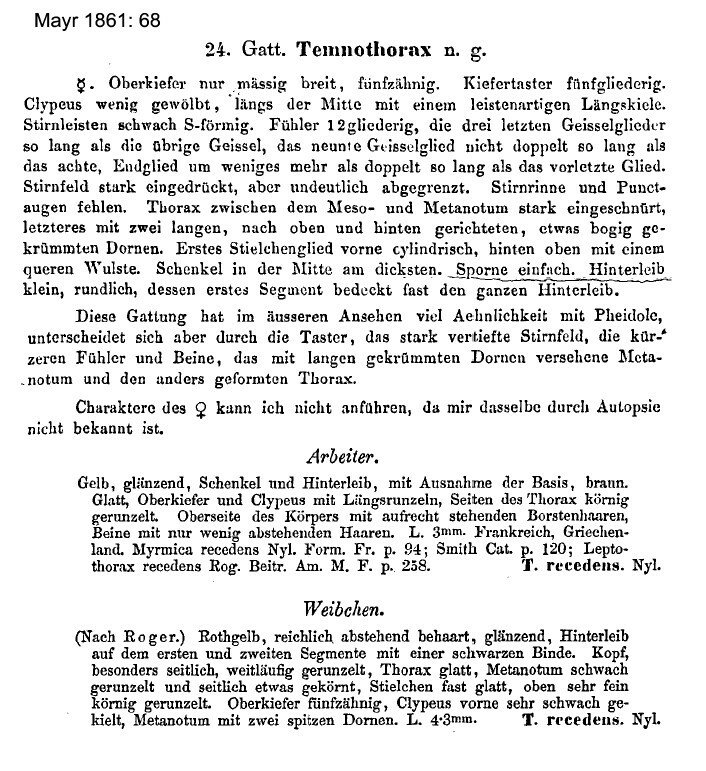 Genus definition Mayr (1861: 68), revived status Bolton (2003: 252). Mayr's (1861) genus definition is at . 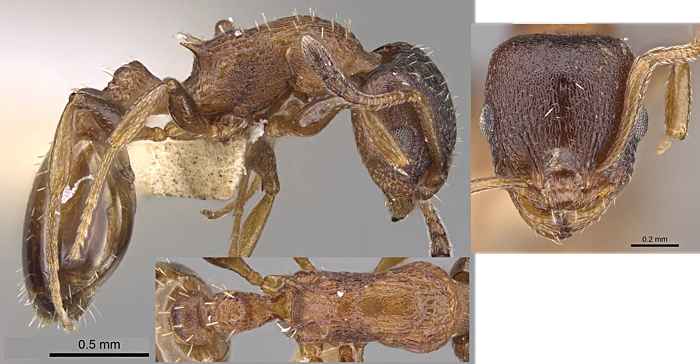 Reversion by Bolton (2003: 270 ff) from one Genus Leptothorax into three Genera Leptothorax Mayr, Nesomyrmex Wheeler and Temnothorax Mayr. 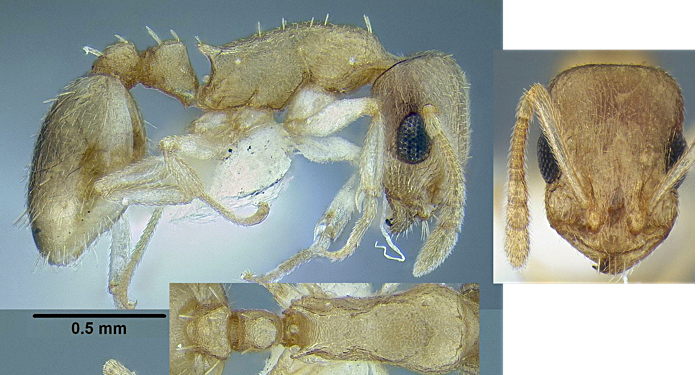 Temnothorax - Median anterior portion of clypeus without a prominent lobe and not overlapping mandibles; transverse crest absent from stipe of maxilla; clypeus with median carina; antennae 11- or 12-segmented (in Africa only 12-segmented). The size range of the Senegal specimens strongly suggests that mpala is nothing more than a population of slightly smaller megalops. The three queens all match also. Holotype only. TL ca 3.2 mm, HL 0.73; HW 0.67; PW 0.45; SL 0.51; CI 91; OI 28, SI 79. Antennal scapes short, distinctly failing to reach the posterior margin of the head; compound eyes moderate in size (OI < 30); post petiole globular in dorsal view, widest at the midpoint of the segment; metanotal groove shallowly impressed; head subrectangular (CI > 85); posterior margin of head flat. Smaller eyes max 0.31 of HW; petiole node in profile with sharp posterodorsal angle; antennal scapes surpassing the posterior margin of the head by the length of the first funicular segment; postpetiole widest at the anterior 1/3 of the segment; posterior margin of head rounded; metanotal groove shallowly impressed; compound eyes moderate in size; propodeal spines moderately long. TL ca 3.3 mm; HL 0.65–0.66; HW 0.52–0.53; PW 0.38–0.39; SL 0.63; CI 79; OI 31; SI 120. Antennal scapes surpassing the posterior margin of the head by the length of the first two funicular segments; postpetiole widest at the anterior 1/3 of the segment; posterior margin of head rounded; promesonotal suture shallowly impressed; compound eyes moderate in size; propodeal spines moderately long. Note: the images of rufus do not show the sculpturation reported by Prebus (2015): "Sculpture of mesosoma in dorsal view with predominately longitudinal rugae on pronotum and mesonotum, becoming increasingly reticulate on the propodeum. Space between propodeal spines with several fine transverse rugae, propodeal declivity finely punctate. In profile, mesosoma rugo-reticulate; longitudinal rugae stronger on pronotum, becoming increasingly reticulate on mesopleuron, and giving way to coarse punctation on metapleuron. Petiole and postpetiole finely punctate, with weak overlying rugosity." Pilosity seemingly more abundant than the barryi type and not unlike that on rufus. The size and overall apperanace set it apart from the latter. Prebus (2015) had: metanotal groove absent, barely visible as an indistinct break in the sculpture dorsally in some specimens; posterior margin of head flat. HL 0.60–0.67; HW 0.45–0.49; PW 0.34–0.37; SL 0.43–0.47; CI 73–76; OI 37–42; SI 100. HL 0.63; HW 0.48; PW 0.36; SL 0.57; CI 76; OI 32; SI 108. Antennal scapes surpassing the posterior margin of the head by the length of the first funicular segment; postpetiole widest at the anterior 1/3 of the segment; hairs on the posterior margin of the first gastric tergite separated by about their own length; posterior margin of head rounded; metanotal groove shallowly impressed; compound eyes moderate in size; propodeal spines short. Overall light reddish brown, with head and gaster slightly darker.